Hello everyone! I'm a little slow getting going today. We're having some family difficulties and I just did not sleep well last night...or at all is more like it! I love my family so much and when it's out of whack it breaks my heart! 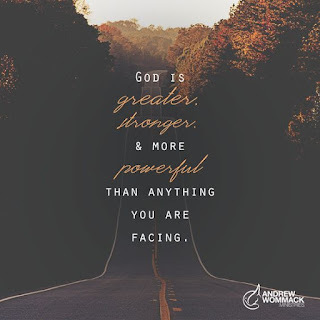 I know that I am not in control and I believe in the power of prayer! I love the quote "If God brings you to it...he'll get you through it"! For this I am VERY THANKFUL!! It's time for another "Make-It Monday"...and you're gonna love it!! Nothing says Happy Labor Day like a Christmas card! ;-) This card was created using TWO new holiday catalog stamp sets available Wednesday, September 5. 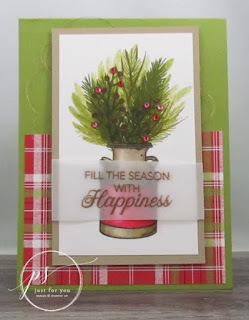 Attach the plaid DSP to the card front. Color 7-9 small rhinestone with the Real Red Dark Blends marker and set aside to dry. Stamp the jug with Memento ink on the white cardstock. Color the jug with the Blends markers. Stamp the greenery from the “Peaceful Noel” stamp set into the jug. Use the 3 green colors to create the various shades of green. Stamp the branch image with Soft Suede ink. You can easily line this up with the photopolymer stamps, but you could also create a small mask for the lip of the jar. Stamp the Berry Branch from the “Love What you Do Stamp set” with Mossy Meadow ink. Color in some of the Berries with the Cherry Dark Blends marker. Attach the stamped image to the Crumb Cake mat. Stamp the saying with Versamark ink on the Vellum cardstock. Wrap the edges of the vellum cardstock around the Crumb Cake cardstock. Secure it at the back with Snail adhesive. Add the colored rhinestones to some of the berries. Use Wink of Stella on the other berries. Make a puddle of copper thread on the card. Attach the image/saying with dimensionals to the front of the card. Isn't this a BEAUTIFUL card? I just love it! I hope you'll give it a try! THANKS SO MUCH FOR STOPPING BY TODAY!! I'll see you tomorrow with Tuesday's Tip! REMEMBER....use this months hostess code FGYGZMR9 and place a minimum $50 order (before tax and shipping)...and you will also receive the gift pictured below ABSOLUTELY FREE! 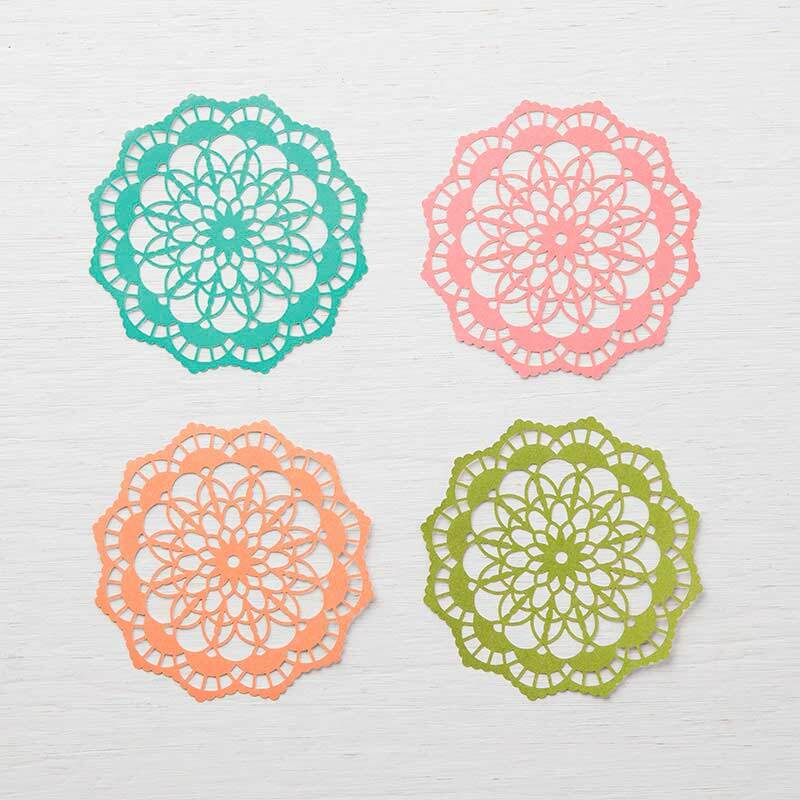 Colored Doilies (a $4.50 value). The projects we make in my September classes! Here's what were making this month! If your order is $150 or more, DO NOT use the code because you will receive hostess credits. You will get the gift from me FREE automatically along with the projects we make in my September classes! Your FREE gifts will be shipped separately and will be shipped during the 1st week in October or before if possible or along with the free class items if you order the bundle. If you have ANY questions...please contact me! I'm here to help! I EARNED GREECE!!! THANK YOU BUNCHES!!! !